And yet, in his recent speech at the U.N. General Assembly, Israeli Prime Minister Benjamin Netanyahu warned about Iran’s nuclear energy program. As part of this tirade, he compared North Korea with Iran in terms of both countries' nuclear programs. Of course, the obvious flaw in Netanyahu’s “logic” is that Iran has no desire for nuclear armaments. Instead, Iran strives to transform into the economic and geopolitical superpower that it is destined to become once international sanctions are lifted. Moreover, the Iranians do not need nuclear weapons to achieve this end. In defiance of the incredible campaign to keep Iran down through futile efforts which have been waged incessantly since 1979 and have continued to expand-Iran is already the world’s 17th largest economy (by purchasing parity power), trending towards 15th. Despite the strains international sanctions impose on its economy, Iran’s GDP (ranked 21st in the world) continues to grow. They are diversifying their economy in order to work around the extraordinary sanctions regime, and have been making extraordinary gains in science and technology. However, because Iran does not want to end up like Saudi Arabia, nuclear energy is a big part of this long-term vision. The KSA has built its entire economy around oil, and they do not really have much else to offer. Accordingly, they do not have much of a future. As the oil from Libya and Iraq begins hitting the market in earnest, the price of crude will drop substantially. Moreover, as the United States ramps up its energy production and exports, becoming a net-exporter of petroleum, and as much of the world moves from fossil fuels into renewable-even if the sanctions remain in place on Iran, the Saudis are running on borrowed time. They will still be able to sell to emerging markets, particularly India and China, but at a much lower premium level. Now, if Iran’s fossil fuels also go to the market-given that they possess more than 10% of the world’s proven oil reserves, 15% of its natural gas reserves, and 1.9 billion short tons of coal reserves-the price of fossil fuels will drop significantly. Simultaneously, these energy sources will likely be subject to a host of new environmental regulations aimed at limiting their use, or increasing their cost in an attempt to encourage developing nations to decrease their reliance. Accordingly, Iran’s future cannot be viably built around fossil fuels. This is one of the major reasons Iran seeks nuclear power as a more sustainable, and likely more profitable, alternative means of energy production. This is also why Saudi Arabia is struggling so hard to keep Iran on the margins--an economically integrated Iran poses an existential threat to the Wahhabi Kingdom, already under immense and growing internal strains. The United States would be well-advised to extricate itself from this ill-fated ally. In the meantime, there should be no doubt that Iran’s nuclear ambitions are strictly peaceful. 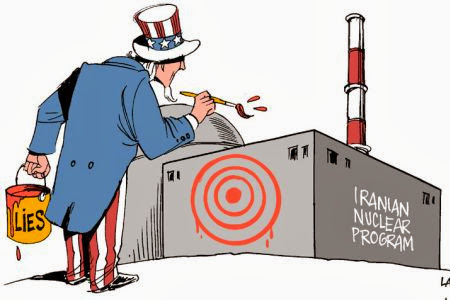 Meanwhile, in August 2005, Ayatollah Khamenei declared a fatwa against the production, stockpiling, or use of nuclear weapons-pronouncing unequivocally that they are forbidden under Islam, and that the Islamic Republic of Iran would never acquire, let alone deploy, these weapons. This ruling is of paramount importance in the case of Iran. Since if the religious authorities wield a lot of control over every facet of the state, as the West is fond of claiming, then the chances of Iran developing a nuclear weapon will virtually be non-existent as long as the Islamic jurisprudence, also known as Velayete Faqih, remains in place. In fact, as long as Iran’s citizens continue to defer to the religious leadership of Ayatollah Khamenei, they will continue to reject the production, stockpiling, or use of nuclear weapons indefinitely. The persistent paranoia among Western policymakers is based on their near-total ignorance of Shia Islam and their distrust of Muslims. Nonetheless, President Rouhani is working to overcome these shortcomings of his interlocutors through increased transparency and a more congenial tone. The West should reciprocate by dropping its own “tough guy” posturing, and negotiate to resolve these longstanding issues directly and in good faith. They must ignore their toxic “allies” in Israel and Saudi Arabia, who seek to undermine Iran for a host of unfounded reasons. In fact, if the United States and the international community are truly so concerned with nuclear non-proliferation in the Middle East, their efforts would be better spent on Israel and Pakistan--both of whom are known to possess weapons of mass destruction, and both of whom act as radically destabilizing forces in the region. Iran has long been at the forefront of calling for cooperation towards this end.